The whirlwind of winter is upon us as we enter the busiest travel time of the year. Trains, planes, and, automobiles unite loved ones and give the gift of experiences. Whether you’re chasing the sun or surprising mom in the snow this holiday season, it’s never too late to choose to travel. In this cheerful chaos, we decided to compare four last-minute hotel-booking apps just in case you last-minute decide to book a trip home or anywhere in the world. Easily the first and the largest last-minute hotel booking app, HotelTonight can find travelers last-minute deals anywhere. In addition to its massive database of properties, we love that its search feature has labels about the ambiance of the hotel: “charming,” “hip,” “basic,” “solid,” “luxe,” and more. Thanks to the apps wide range of properties, you’ll always find a great deal. HotelTonight has 15,000 properties in over 35 countries across the Americas, Europe and, Australia—you’re pretty much guaranteed to find a bed. While the app began as a same-day booking service, you can now book up to 100 days in advance, and reserve as many as 14 nights. If your en route, keep an eye out for properties with special Geo Rates. Geo Rates give users discounts based on their GPS location. Sometimes you can score a better deal if you book from home or from the airport rather than upon arrival. A major travel search engine, Hipmunk finds deals on flights, hotels and more. It will scour the whole web, including Kayak, Hotels.com and, Expedia, so trust the app and let it do the work for you. It’s simple to find the cheapest bed since it allows you to filter by price—and also by review rating, location, property type, and amenities offered. Book in advance or last-minute, for as many nights as you want. Hipmunk has a huge collection of hotels worldwide. Use Hipmunk for flights, too. We love its table that compares flights side-by-side based on their price, time, frills and carrier. Imagine if you could pay for a hotel room for only when you’re using it. As You Stay makes this dream a reality, introducing hospitality that you pay for by the hour. It’s perfect for last-minute stays and layovers. Rates are priced according to the number of hours of your stay, so you’re not limited to the hotel’s standard check-in and check-out times. Book up to four days in advance, staying anywhere from one hour to four days. As You Stay is available in dozens of U.S. cities so far, as it just debuted early this year. Cross-check your prorated hourly rate against its nightly rate to ensure you’re scoring a good deal. Sometimes it’s only a few more bucks to stay the whole night. Operated by the Standard Hotel Group, One:Night specializes in finding day-of deals at boutique hotels. Beginning each day at 3 p.m., One:Night users can book a hotel room for that evening. Given the apps vested interest in most of the hotels listed, this app really will find you the best price cuts on trendy properties. One:Night started expanding internationally in October, and is currently available in the US and UK. Cities include Boston, Miami, LA, NYC, Nashville, Washington D.C., London and Austin. The app lists standard properties plus other boutique hotels, so you’re sure to find a trendy bed. You can only book the day-of after 3 p.m., and you can only reserve one night at a time. While bookings don’t open until 3 p.m., you can still browse the app and utilize its offerings. When you click on prospect properties, the app will show you suggestions of things to do at and around that hotel. Our preference for choosing the best last-minute hotel booking app? HotelTonight. Its veteran status makes it the best through and through. So, if you’re going to download just one—go with HotelTonight and relish in the freedom and savings of last-minute booking. Cheers! What do you buy the person that values experiences over possessions? That’s easy. We’re here to help you think outside of the bag (pun intended). Here are our favorite goodies for the globetrotter—all items are sure to enhance any trip and delight every traveler. Modern travelers know the two things that make airports bearable: a charged phone and a carry-on bag. 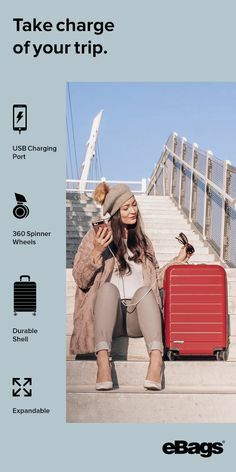 With luggage fees soaring and outlets at a premium, this exclusive collaboration between eBags and Samsonite has produced our absolute favorite and best-selling carry-on, err, I mean personal item—the Spinner Underseater with USB port counts as a personal item AND has a USB port. WIN. WIN. Know any vloggers? Whether your favorite video blogger is professional or amateur, recording videos has to be one of the best ways to remember a trip. While phones have decent built-in microphones, they tend to pick up loads of background noise. This tiny microphone can plug into any headphone jack to capture professional-quality audio. Give them the gift of choice with an eBags gift card! Available in any amount and also in any form. Order a physical card, print a card, or send an e-Giftcard to a traveler anywhere in the world. Ok, this Ostrich pillow is incredible. Any international traveler will rejoice with the gift of this travel pillow. It makes long-haul flights bearable thanks to its wrap-around design—even if your head bobs forward, it will cushion your head so you arrive at the destination without any soreness. It’s legit and you and all your traveler friends should have one. We are forever obsessed with the eBags Connected Luggage Tag. Why? Because it’s not like other bag tags. It has several super cool, Instagram photographed designs and a QR code—keeping your personal information away from wandering eyes and the tag makes your bag trackable in the event you two get separated. And the greatest gift of all? No-stress shopping. Get all of these presents from eBags with plenty of time before the holidays. Shop now! From stocking stuffers to suitcase lovers, we found the best gifts that every traveler wants and every budget approves. Whether your loved one is on a quest to travel more, spend less, or merely live a healthier lifestyle, these five gifts are sure to align with their 2018 resolutions. Drinking more water is a fantastic resolution. It’s simple and painless with major payoff—better skin, sharper wit, the list goes on and on. Our solution for staying hydrated on the go? The que Bottle—a collapsible silicone water bottle. It’s lightweight, durable and dishwasher-safe! We predict this will be the hottest bot of 2018—which means it’s the best gift to give for Christmas 2017. This stylish keychain solves two problems: finding your keys and charging your phone. Need I say more? It’s subtle yet absolutely genius AND it’s only $23.99. 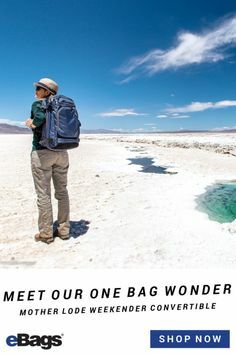 This feather-light bag packs more than you would think! It’s compressible, stain and water resistant, and while only three ounces it’s remarkably strong. Available in three colors! While the positive effects of snoozing are infinite, it’s often hard to catch quality shut-eye—especially when one the road. Get the traveler in your life (or yourself) a sleep mask and neck pillow! We love this mask in particular because the hundreds of microbeads mold perfectly to your face to keep your eyelids closed, and it comes with earbuds. Save money, time and sanity when you shop gifts online. 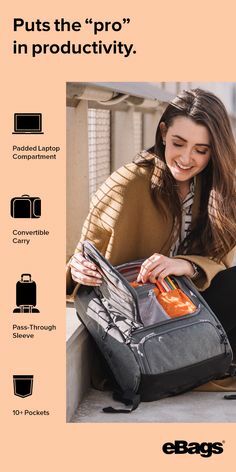 Shop now at eBags.com! We believe the best gifts fit inside suitcases. It can be tricky to find gifts for the traveler, as their soul is full of experiences while their bag is full of souvenirs. We recommend getting your loved ones compact technology that will make the world of difference. Futuristic finds can put an extra pep in travelers’ steps and provide that much-needed energy from the holidays to the layovers throughout 2018 and beyond. To help you score presents that won’t disappoint, we’ve compiled a list of five gadget-licious gifts that no one has but everyone wants. We charged, downloaded, played and tested this year’s best travel technology to help you know exactly what to buy this year. And the best part? These gifts are traveler-tested, and humankind approved. Be a saint this year and ensure the traveler in your life never has to ask or hear that question again. In fact, give everyone on your list a Tile. But first, what’s a Tile? Probably the best invention since the internet. This sleek square “Tile” attaches to any of your possessions to make them locatable. You can ring your keys from your phone and your phone from your keys. Can you hear me now? That’s the sound of sanity. They have designs for key rings, slims (slide into your wallet or pocket), and more. At only $30 a pop, this is the perfect stocking stuffer. Give peace a chance with the ChargeHub, offering space for seven USB cords all at once. Only one outlet required for over half a dozen charges—ideal for when you’re on the road and sharing a room or charging multiple phones, cameras, and backup batteries! What are the holidays without music? Whether you’re rocking out to Mariah Carey, the Beach Boys, or Beiber, turn up the volume with the Bose SoundLink Micro Bluetooth Speaker! We promise it will be the hit of the (every) party and be extremely useful all year long. This speaker boasts best-in-class sound and it’s portable! From your office to the hotel to the mountaintops, sing out loud! Especially during the holidays, airports are at full capacity with TSA security lines crazier than the North Pole on Christmas Eve. For this exact reason, frequent travelers should enroll in TSA Pre-Check to skip the lines and keep on their shoes. BUT if you’re overseas or looking for the perfect present for the traveler in your life, meet the SwissGear’s Scansmart padded sleeve—this pack is TSA-approved so your traveler won’t need to remove the laptop from their pack, saving on time and hassle. It’s the perfect bag to safely house all tech toys, with its reinforced pockets and zippered sections. Paper gift tags are soooo 2016. Get with it, and tag your goodies with labels they’ll actually use. At only $7, the eBags Connected Luggage Tag is the same price as a bougie bow. Choose from one of the dozen designs! This tag’s QR code syncs with an app so you can locate lost luggage worldwide without revealing personal information. Hey, that was easy! No matter where you’re spending the holidays or what trips are on the 2018 horizon, these tech-friendly gifts for gearheads will make the journey so much more enjoyable. Bon voyage and Bon appetite! Tis the season for family, friends, and food. Whether you’re going far or near to celebrate the holidays this year, be sure not to arrive anywhere empty-handed. 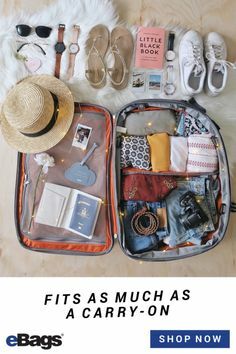 See below for some brilliant tips on traveling with food including what to bring and how to ensure your sugar-cookies, casseroles and french silk pies stay in-tact while in transit. The day stuffed with turkey and pumpkin pie typically comes with a side of travel. According to the Bureau of Transportation, 91% of people will be traveling to Turkey Day in a vehicle—and given that the average trip length is 214 miles, bringing travel-friendly dishes is a must. This means letting the hosts handle the turkey, or alternative main course. What’s Safe to Bring in the Car? Carbs for starters: bread, chips, cookies and more nibbles. Beverages, sides, and appetizers can also take a road trip if you pack them in a cooler. *Ahem: the eBags Crew Cooler just so happens to be fantastic. 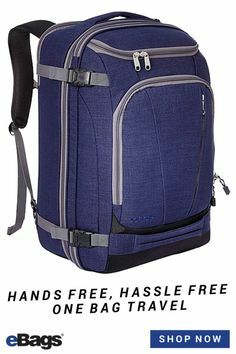 * Its soft sides and adjustable strap make it ultra easy to pack and carry. It’s insulated with PVC-free PEVA liner to keep your goodies cold for hours, from the city to the country and back again. Most appetizers and desserts are also travel-friendly. As a general rule of thumb, it’s best to partially prepare these types of dishes before departing and add the finishing touches after arrival. If you’re bringing a salad, put the dressing in a small Tupperware container so that the leaves don’t get soggy. Pack spices and toppings, such as nuts in Ziplock bags, to save on space. 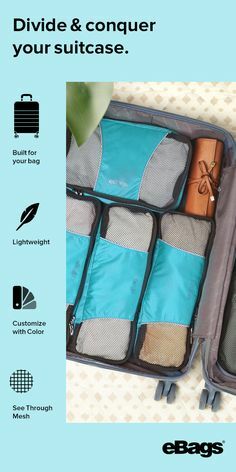 Another great aspect of the eBags Crew Cooler is that it makes compartmentalizing simple, with its several zippered pockets incl hot and cool sections! Expert tip: If you have spacious extras—bottles of wine, bags of chips, etc—stash them in this handy trunk organizer! If you are thinking about bringing food on your flight, the easiest way is to tell your host that your presence is a present, and you’ll happily go with them to their hometown’s grocery store and help out in the kitchen! Another easy route is to grab some goodies at the airport, once you’re through security—bonus points if you get something local, like San Francisco sourdough. If you’re set on bringing home-baked goods, you’ll want to carry them on and brush up on the TSA food guidelines before heading to the airport. Anything coming close to a liquid—like butter, cream cheese, canned goods, dressings and other spreads—are regulated by the three-ounce rule. Hard foods are fine as long as they won’t spoil. Regardless of what you are trying to bring on the plane, we suggest carrying on the goodies to ensure they don’t squish or crumble en route. Expert tip: Double-bag all goods in case of breakage. That’s a wrap! We hope these travel tips will help keep traditions alive! Think travel agents are outdated? Think again. App-enabled travel has resurfaced the travel agent, making them more affordable—and accessible—than ever before. What’s more? These modern-day travel agents have artificial intelligence (AI), boosting their brains and brawn. Even better: personalized, efficient help doesn’t have to be costly. Not sure which service is right for your trip? In this installment of our Travel App Showdown series, we did a side-by-side comparison of two popular travel booking apps—Lola and Journy. Find out which app will score you the best deal! If you’re a vacationer who needs help with the “fun stuff”—booking restaurants, tours, and hotels—then Journy will be your attentive local guide in over 60 cities worldwide. Lola, on the other hand, has re-focused its app to cater to business travelers. Lola is more like a personal assistant, one who’s happy to make dinner reservations but its main focus is to handle all the logistics of your trip. You can expect Lola to scour the web to find you the cheapest deals as well as make updates to your itinerary in real-time, because well, life happens. How Often Do You Want To Talk to Your Travel Agent? Both Journy and Lola will keep you in the loop with your reservations, alerting you when your trip is approaching or if anything changes. Both services are chatable within the app, making it easy to update your hotel reservations or ask questions about dinner on the fly. Booking is a breeze with both services, but in the event that something goes wrong—such as a missed connection or flight cancellation—Lola will save the day. Lola’s subscription-model offers a travel agent available 24/7 who is able to call airlines, hotels and more to develop a backup plan. Lola knows you better than you know yourself. As Lola is geared towards business travelers, personalization is king. If you’re a frequent traveler, the AI quickly learns your preferences, as does Lola’s team of expert agents. Lola also has your best personal interests in mind—by ranking various options for hotels and restaurants by your preferences, not by business incentives. Journy knows you as well as you know yourself. Journy prompts you to fill out a short survey before adventuring. This is where you will insert dates, personal info, and trip details. It also asks for deets about your party size, budget, dietary restrictions and restaurant preferences (meal with a view, hole-in-the-wall, booze-free-friendly, and more). From there, Journy acts as a concierge, presenting curated options and will book anything upon request—all you need to do is tap yes! How Much Do These Travel Agent Apps Cost? Lola’s founder (who also co-founded Kayak) believes the more often you travel, the more value you’ll score from Lola’s services—therefore Lola’s pricing is based on a subscription model. To celebrate the app’s revamp, it’s free through the end of 2017! Which gives you plenty of time to test out the app and see if it is a good fit for you. Prices for 2018 are TBA. If you travel to play rather than for work, Journy’s pricing model is made for you. A subscription model is available for those with generous vacation time. The app charges by the day (approximately $15-20 per day), which is a steal. But FYI, Journy is only available on iPhones at this time. Traveling is a full-time commitment—having a little assistance will help eliminate the stress of planning and ensure a successful trip. Our advice? If you’re a frequent business traveler, subscribe to Lola. Vacationers, bring Journy on your next trip. Cheaper travel means more travel, and who’s not always trying to travel more? Experiences are priceless, and we’re invested in keeping your bank account rich while making your life even richer. So buckle up for an adventure, and come back with stories and Euros to spare. Saving money on the road is all good and dandy, but what about saving up for a trip in the first place? The Digit app makes saving effortless. It automatically pulls money from your checking account and deposits it into a separate F.D.I.C. insured savings account that Digit opens for you. You can text the app and ask it to save more or less depending on the month. The best part? Digit’s algorithm promises not to let you overdraft—but just in case, it includes overdraft protection. Coupons are great, but cash is better. Shop via the Ibotta app to score exclusive cashback rebates from your favorite shops and sites including Amazon, Apple Music, Lowe’s, Chevron and more! But more importantly, score 10% cashback from your friends at eBags. YEP! You can get a cash reward when you buy something from eBags such as the TLS Mother Lode Weekender Convertible. You’re welcome. If you’re gone for a week or less (and not a VIP flyer), we suggest you only bring a carry-on to save money on baggage fees. Not convinced? Here’s a breakdown of checked-luggage fees: Alaska, Horizon, American, United, Frontier, Delta, and Virgin all charge $25 for your first checked-bag, while Spirit charges a whopping 45 bucks. Your affordable allies are JetBlue and Southwest, letting travelers check one or two bags for free. Expert tip: We kind of specialize in the whole one-bag travel thing. Watch our How to Pack Like a Pro: One-Bag Travel edition. Sometimes you have to spend a little to save a lot. Knowing where your suitcase is? Priceless. Or in this case, $5 for a lifetime of luggage-tracking. Meet the eBags Connected Luggage Tag. It has a QR code that connects to an app—so your personal information remains private, but once someone finds it, they can return it to you within a few taps. The tag’s cloud technology lets you update your contact info on the bag in real time, just in case you’re switching between SIM cards. Expert tip: Another way to save your sanity while traveling is a little thing we like to call compartmentalization. 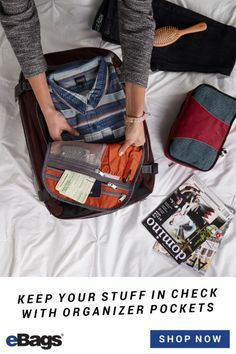 If your bag is 7 pounds overweight, rather than deconstruct and then reconstruct your entire suitcase in public just yank out the shoe bag or easily remove one of your packing cubes. Problem solved. Sanity saved. Food and travel are a match made in heaven—but a common misconception is that eating like a local means dining out. In reality, locals cook. They are people just like you and they cook delicious food at home too. So go to a local grocery store or a street market, a cultural experience in itself, and get to cooking! If you don’t have access to a kitchen, there’s a good chance the store has a few ready-to-go meals far cheaper than you’d find in a restaurant. When it comes to decoding sugar VS salt in the aisles, rely on Google Translate to scan the packaging and translate it right before your eyes! If you are an occasional traveler, being able to easily keep in touch with your friends and family at home is super important. You’ll also want to make local calls to restaurants, hotels, airlines and the like. We recommend you get a local SIM card—much cheaper than International fees from American carriers, and you’ll be able to text your new local friends. Or, if you have an Android, check out Project Fi by Google—which is just $20 per month for unlimited minutes and text, plus just $10 a month for a gigabyte of data. If you don’t know by now, public transportation is a widely accepted form of travel when you are overseas, and a huge money saver! If you are more of a DIYer, use car-sharing services like ZipCar or Car2Go to save bigtime on car rentals. 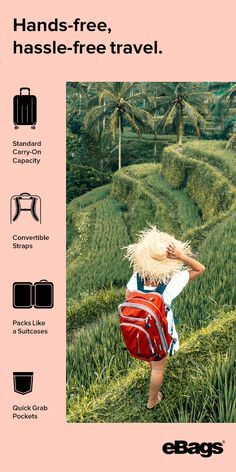 They’re especially great for day-trips, as you can pick them up from anywhere in a city, rather than strictly at the airport. Yes, you can have your exotic food and eat it too. Trimming down will help you take-off way more often, with no reservations.